Cloud Volumes Service is available in many AWS regions. You must specify the region where you want to use the service before you create a cloud volume. Navigate to the NetApp Cloud Orchestrator site, and then log in with the email address that you provided during your subscription. You should bookmark this URL. You will need to return to it later. From the Available regions drop-down menu in the top panel, select the region that you want to work in. This selection process is similar to how you change regions in the AWS console. Repeat the above step for each additional region when you want to create a cloud volume. Note: The regions displayed in the Cloud Volumes user interface may use a different format than the region you selected in the AWS user interface. For example us-east-1 in the Cloud Volumes UI corresponds to the N.Virginia region selected in the AWS console. 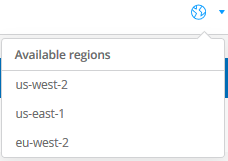 See Regions and Availability Zones for a mapping of the region names to make sure you select the same region in both interfaces.